Join us on a Small Group Tour of India inspired by the movies and TV shows that have revealed the bustle and cacophony of everyday life in India. As well as seeing the great sights of Delhi, Rajasthan and Kerala, you’ll meet local families, shop in colourful markets and enjoy the vibrant flavours of regional Indian food – all while staying in some delightful heritage and home-stay hotels. Your Tour Manager will be waiting to meet you when you arrive in Delhi this morning, before we head into the heart of New Delhi and our first family-run hotel. Freshen up, then join your fellow guests for lunch in a local restaurant. Spend the afternoon and evening relaxing in anticipation of the for the exciting days ahead, before dinner at the hotel. Today begins with a visit to the Gandhi Smriti, the house in which Mahatma Gandhi spent his last days. From there we’ll head to the National Railway Museum, which celebrates the history of India’s favourite form of transport. After an included lunch at the colourful Chor Bazar restaurant, we’ll continue our tour of Old Delhi. See the historic Red Fort, Jama Masjid Mosque and Raj Ghat (Gandhi’s cremation site close to the Yamuna River). Take an exhilarating rickshaw ride through the narrow lanes of Chandni Chowk, and round off your day with a pre-dinner guided walking tour of Chandni Chowk bazaars and food markets, learning about Old Delhi’s food scene, before you retire to the hotel. This morning, we’ll explore New Delhi. Built by the British Raj to reflect the glories of Empire, its highlights include the die-straight expanse of the Rajpath that sweeps from the Rashtrapati Bhavan (formerly Viceroy’s House) to the India Gate war memorial. After the tour, you’ll leave Delhi and travel to the Pink City of Jaipur by comfortable mini-coach. You’ll spend four nights here in a family-run, ‘homestay’ that will serve as your Jaipur base. Meet the family who will be your hosts and enjoy your first dinner at the hotel. Start your day with an optional yoga session, organised by your hosts. After breakfast, climb aboard a Jeep and head out to explore. Prepare to be amazed by the intricate decoration, and stupendous rampart views, at Amber Fort, before we head to a typical local restaurant for an included lunch. After lunch, we’ll continue to Jaipur to explore the ancient astronomical observatory (Jantar Mantar) and museums of the City Palace complex and the innumerable windows and screened balconies of the Hawa Mahal (Palace of the Winds). Later, you’ll have an opportunity to learn about the colourful world of Bollywood dancing before your hosts explain the techniques behind the perfect cup of masala tea, share the secrets of their family cookbook and serve dinner at the hotel. 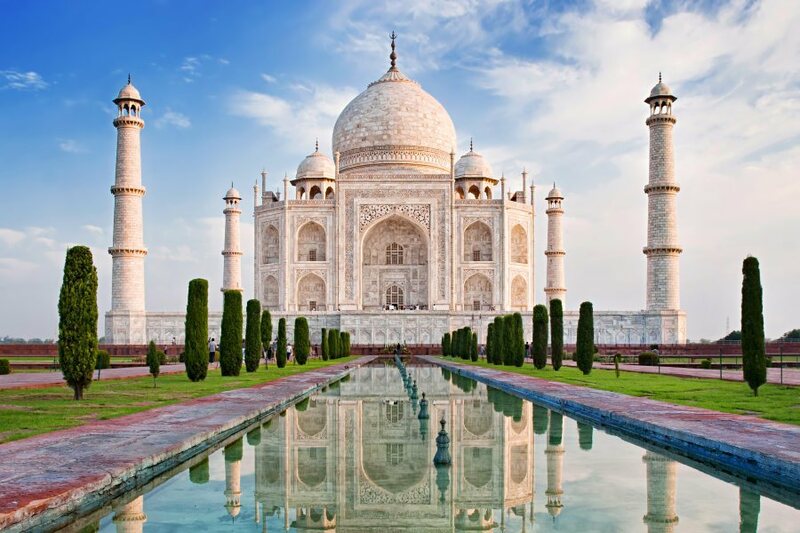 Today you’ll have the chance to explore Agra and see the heartbreaking, enchanting Taj Mahal. You’ll ride the early morning Shatabdi Express to Agra, meet your local guide and visit the Taj Mahal before enjoing an included lunch. In the afternoon you’ll visit the royal pavilions, palaces and courtyards of Agra Fort and tour Agra’s elegant colonial quarter. Stop for tea at a local family’s colonial home, before returning to Jaipur. Those staying in Jaipur will be able to join an intimate tour of the city’s heritage districts – location for some of ‘The Best Exotic Marigold Hotel’ filming – and witness a traditional Aarti ceremony at a local temple. Spend today travelling by tuk-tuk or cycle rickshaw to the local market with your hosts, and getting to know the local culture and cuisine. In the afternoon you’ll also have the chance to visit Elefantastic, a conservation sanctuary, where you will have the chance to meet some of the rescued elephants that live there. This evening, help the family preparing a meal from the morning’s purchases and learn how to make lassi (India’s national yoghurt-based drink). Today you’ll journey across Rajasthan, its landscape studded with exotic temples and lavishly decorated mansions (havelis). Call at historic, fortified Chittorgarh on your way to the sublime City of Lakes, Udaipur. Here, against a background of rolling hills, the waters of Lake Pichola are home itself to two exquisite marble palaces, both overlooked by the majesty of the City Palace. This evening, you’ll have the chance to take a tuk-tuk ride around Udaipur’s evening illuminations and enjoy a night at the movies with your guide at a Bollywood picture house. Early this morning you’ll be able to join your guide for a cycle ride through Udaipur, pedalling through the awakening streets to see the ‘real’ city’s market traders and local craftsmen at work. After breakfast back at the hotel, we’ll head out on a guided tour of Udaipur’s main sights – the dome-turreted City Palace, Jagdish Temple and the Saheliyon-ki-Bari – the beautiful Gardens of the Royal Ladies. An afternoon tour, once again by tuk-tuk, takes in colourful local markets and temples, before your wonderful day draws to a close with an evening cruise on Lake Pichola and dinner overlooking the majestic City Palace. Today we head out of the city to the possibly familiar surroundings of the Ravla Khempur. This fortified mansion is now an equestrian hotel with a celebrated stables, and was the used as ‘The Best Exotic Marigold Hotel’ in both movies. Enjoy lunch at the Ravla Khempur, then join a local resident for a walking tour of the village (another filming location) before returning to Udaipur. Why not mark your final night here with an evening of traditional dance, music and puppetry beside Lake Pichola in the grounds of the Bagore-ki-Haveli? Say goodbye to your Udaipur hosts, and head to the airport to catch an early morning flight to Kochi via Mumbai. Your hotel here lies in the heart of the historic Fort Cochin area of ancient trading seaport. Rest and relax there, then head out as evening falls to experience a traditional Kathakali performance, combining dance, costume, ancient literature, music and painting, and to enjoy dinner at the historic Le Colonial hotel, setting for The Real Marigold Hotel TV series. Today, once again travelling by tuk-tuk, you’ll enjoy an included guided tour of Cochin (as Kochi is also called). See Mattancherry’s Dutch Palace, the 16th-century Paradesi Synagogue and Fort Cochin’s famous Chinese fishing nets – which have become are one of India’s most photographed sights. In the afternoon, we’ll explore Fort Cochin’s colourful fish market, joining a local family to purchase the fish and vegetables that will be prepared, cooked and served as your dinner this evening. Spend today getting to know the customs and culture of Keralan life. Meet local fishermen as they land their catch early this morning, see mat weavers and coconut yarn makers at work, and eat breakfast in a beautiful backwater farmhouse with your local family. Criss-cross the beautiful countryside by tuk-tuk and canoe, and this afternoon, join your guide to continue exploring on the same buses and ferries that the locals use. Today begins with a short journey to Alleppey, and a visit to a small temple. Join a local family, to prepare and eat a traditional lunch, then board a thatch-roofed ‘kettuvallam’ houseboat to cruise lazily through a labyrinth of canals and waterways lined with coconut groves and rice fields, and dotted with tiny islands. After the cruise we’ll continue to your final hotel, in the relaxed beach resort at Marari. We’ll have an early start, today, (a packed breakfast will be provided) as we transfer to Cochin International Airport to begin our journey home, flying first to Mumbai, and then on to the UK. We’ll arrive back in the UK this evening, at the end of a wonderful Indian holiday.